On the high-end side of premium football releases, 2015 Panini Immaculate Football returns with the quality designs, memorabilia pieces and autographs collectors have come to expect. Each box includes five autographs or memorabilia cards. Although full details are not available, there will be a base set and collectors will find one base card per box. 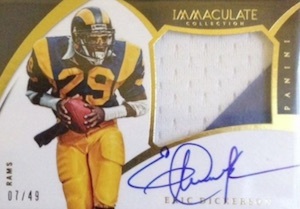 However, Immaculate Football is all about the hits and collectors have plenty to chase. 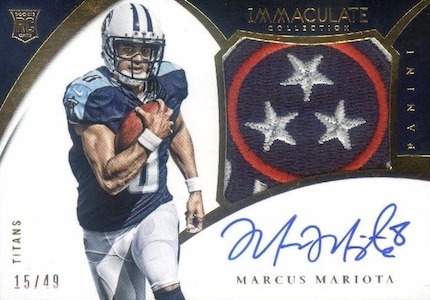 Starting with the rookie-centered autographs in 2015 Panini Immaculate Football, Rookie Patches Autographs are one of the key options and feature a small patch and on-card signature. 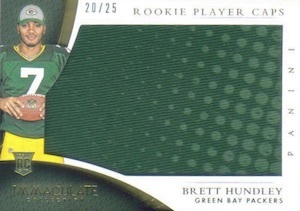 Numbered to 99 copies, there are several parallels including an Acetate version that is numbered to the player's jersey number. 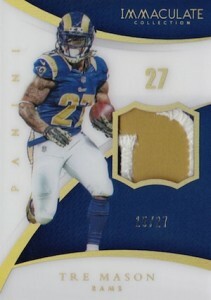 Premium Patches Rookies Autograph cards opt for a horizontal orientation and include a jumbo patch and on-card autograph. Additional signed cards include Immaculate Dual/Trio Autographs that pair two or three players on one card with on-card signatures. Signature Moves showcases the preferred celebration for specific players along with an autograph. 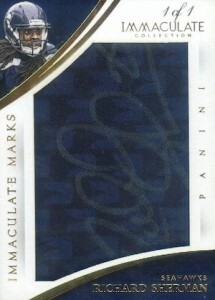 Numbered to the player's overall draft spot, Immaculate Draft offers some very rare autographs, especially for the first overall picks. Also rare, Immaculate MVP covers the most valuable players with signed cards numbered to their total number of MVP trophies. 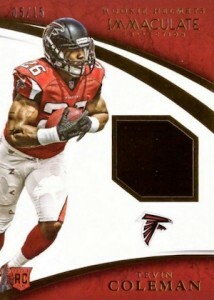 Among the memorabilia cards in 2015 Panini Immaculate Football, several quality choices are available. 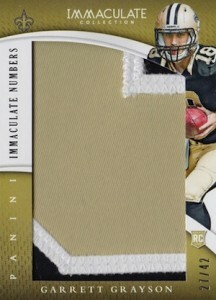 Taking swatches from logos, tags and jersey numbers, Immaculate Logos includes a massive patch piece. 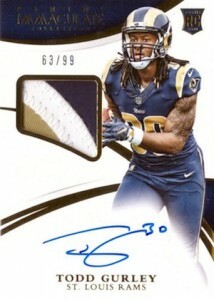 Immaculate Laces focuses on the rookies with cleats and laces featured in the card. 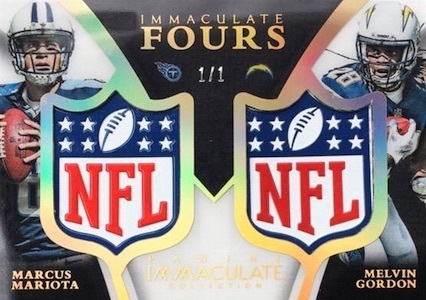 Pairing multiple shield logos on the same card, Immaculate NFL Shields includes Dual and Quad versions that are all numbered one-of-one. 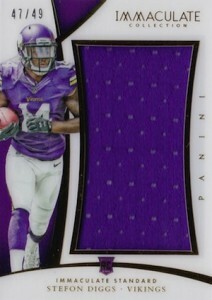 Check back as more information about 2015 Panini Immaculate Football is made available. ROBERT WOODS 2015 IMMACULATE BILLS JUMBO JERSEY PATCH 1 49! FIRST MADE!! RAMS!!! 100 cards. Serial numbered #/99. 17 cards. Serial numbered #/99. 41 cards. Serial numbered #/99. 59 cards. Serial numbered #/15 or as noted. 29 cards. Serial numbered #/15. I thought Panini America was based in Dallas? Michael Irving?!!? Rob Brandenburg � Aikman is spelled wrong as well. They are just mock-ups. I am sure they will get it correct on the actual cards. $370 a box is laughable. So many people are going to be very disappointed after opening a box and trying to figure out how on earth what they just ripped could be even close to $370 a box. 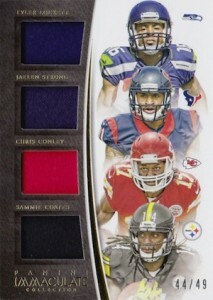 Just more of TOPPS and PANINI just not caring about collectors and just producing to group breakers. I’m going to rate this five stars because I bought two boxes and did not get one single point card. Also, I never expect to get back what I paid for a box and I don’t think that anyone should either. If that was the case, boxes would be all opened instead of sold. 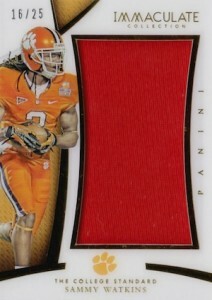 I actually believe Panini has taken the time this year to make the box better. Last year’s was not very good, not to mention the baseball and basketball products were a terrible open. I would rather have six hits though that a base card. I think that is really unnecessary. My two boxes both included two autograph patch cards as well as a low numbered patch card and then two additional memorabilia cards. I was happy. Bought two boxes and got absolutely nothing of value. Maybe can sell each box’s contents for 50-75 dollars max. Sure you get low numbered cards, but that’s nothing new these days when you have 50 versions/parallels of the same guy! All companies take notice: When you sell premium high end products that come out so late in the season, we already know who the popular/better players are. Each box should be HAND COLLATED to include at least one good hit! Either a good player or a SUPER LOW numbered card of other players. I understand you never expect to get your money back on a bust, but at least have some value say of 50%. For high end products, it’s easy to see what single sales are. Any card that comes out of these products and ends up selling for less than $10 is a joke. DON’T INCLUDE THESE CARDS! All cards should be worth at least $25 per card when you ask $375 a box for essentially 5 hits. Also, there should be NO SINGLE COLOR RELICS AT ALL! 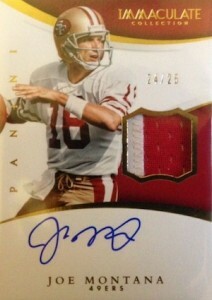 This was one of my favorite sets in recent memory, and yet, Panini will not fill the redemptions. They release a set that sells for almost $400/box, and nearly half the important rookies are redemptions, and here we are, 10 months after it releases, and none of them have been filled. As far as I know, there is not one 2015 Immaculate autograph in the world for Amari Cooper, Tevin Coleman, Karlos Williams, Devante Parker, Jeremy Langford, Philip Dorsett, etc. How can you sell a product for that kind of money, and then not produce the product? They basically are giving you an “I O U” and welching on it, and getting away with it. All of these guys are signing autographs every day for the dozens of other releases since then, so have them sign these? 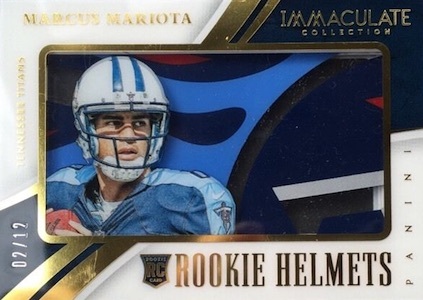 I check the list Panini releases every week on their redemptions, and they haven’t filled anything from Immaculate in weeks, months even. Such a disappointment. Well, it’s been almost a year since my last post on this thread, and nothing, not a single card from my post before has been filled. That’s right, Amari Cooper, Jeremy Langford, Karlos Williams, Devante Parker, Phillip Dorsett and Tevin Coleman have still not signed a single autograph from 2015 Immaculate. There have been no new redemptions filled for the product in over a year (although they do regurgitate the same list of players they already filled, every month or so to make it seem like they filled something). 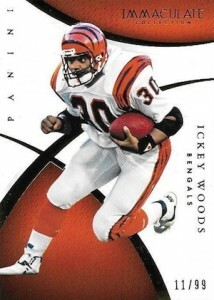 My guess is Panini never even produced these cards, and figure most folks will just give up or disappear and they’ll save money. $400/box, and half of the rookie class never signed almost 2 years later.